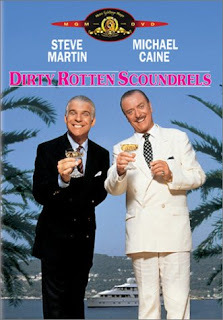 Steve Martin and Michael Caine co-star in this classic comedy about two con artists who schmooze wealthy and corrupt women in order to take them for all they're worth. Each have separately made a fine living off of stolen pearls, cars, and cash, but when both cons begin to prowl in the same French Riviera, fierce competition and hysterical comedy ensues. The ever-so proper Lawrence Jamieson (Caine), is a master of con artistry. He has no time for chasing smaller victims; his eyes are roaming for extremely wealthy and wounded prey. When he finds such a woman, he plays on her compassions, telling her that he is a prince from an impoverished country and only- say $50,000- will save his people. In tears of sympathy, the woman gladly serves the greater good and helps his cause. Now $50,000 richer, Lawrence simply picks up and moves on to the next town. Freddy Benson is in the same line of work, but is far less suave. He's more a hustler than an "artist." He's satisfied, for a while, with smaller game- a free dinner here, $20 there; but when chance leads him to the same wealthy town as Lawrence Jamieson and he sees the British con-artist making 10's of thousands of dollars, his appetite changes. But sooner than later, it becomes clear to Freddy that Lawrence is taking advantage and not treating him with fairness. When working a "victim" together, Lawrence schmoozes the lady while Freddy is forced to play the mental monkey-brother, Ruprecht (see youtube clip on sidebar). So, their feud will be resolved, the two decide, by a not-so-friendly competition: after agreeing on a woman, both will go to work trying to win her affections (and her wallet) while pretending not to know each other. Whoever gets her will be declared the winner. Freddy approaches their target as a paraplegic war vet who's grandmother is on her death bed and in need of surgery money. Lawrence, playing along, becomes the renowned German psychiatrist who alone can cure Freddy of his disorder, emphatically stating that Freddy's is a psychosomatic, not neurological, paralysis. So a battle of wits begins as the two cons try to out-con each other in order to win the prize. After continually upping the stakes and nearly destroying each other, the two cons arrive separately at the same airport where the woman has fled. Both come with a different story about why the woman they've been chasing is now getting on a plane and about to take off. By the time the two cons realize that the woman they were chasing had been playing them from minute one, the plane was already in the air. She had spun them around to dizziness and proved to be the better con. It's a great comedy with a surprising twist (well, now that I spoiled it, maybe not so much). But it's definitely a classic 80's movie in my book- well worth owning on DVD.